Who shall win in a great, titanic, and epic war/ battle between good and evil? In Dexter's Laboratory episode called Decode Of Honor, Which one of These Two Fan Clubs would you like to join in?, Action Hank or Pony Puff Princess? DO YOU HATE DEE DEE? The fans pick: DEEDEE! GET OUT OF MY LABORATORY!! What was the last episode you watched? 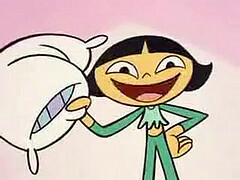 Whatever happened to Dee Dee’s two ethnic friends Mee Mee and Lee Lee? What if Dee Dee’s friend Lee Lee is the main central protagonist and the heroine at the very heart (or center) of an epic coming-of-age tale? the story begins with Dexter working on his time machine to make him go anywhere in the universe until all the sudden his sister dee dee comes and says HI DEXTER!! dexter: dee dee you scared me like that! and what do you want? dee dee: i just want to know what that's stupid thing you made huh? just to let you know stupid sister this is a time machine i built to let you go anywhere in the universe and visit places so this is it so the portal will let us see what it's like in other places. Lilimaia is a proud and pure warrior maiden of few words who is as mighty, brave and noble as she is young, fair and beautiful, and who is prophesized to be the one to bring about the downfall of the evil Dark Lord Mandark. [i]Natowodin reached far down the heavens with His mighty hand. He knew the world's salvation lay hidden among the people. He brought her from His image down to the people in Shangara. The boy genius identified her to us. Passed all tests, became a warrior. Hi everyone im Ging and this is my first ever article! first let me just say a few things and couples I like! Couples:Ash and May,Blossom and Dexter,Ginger and Mandark,Barry and Dawn,and Zekrom and Reshiram! it begins in dexter's lab when a suddenly Buttercup,Blossom,and Bubbles come crashing through the roof. Sammy is having her name changed to sullivan. Though, she will preffer to be called Darkgal. OK now I know I was gonna do this like months ago but! We're doing it now.So once again, I'm the interviewer, and i am here with Mandark Astronamanov.Let's get this started. Interviewer: Ok, well Mandark I've gotta say, It is great that I was finally able to contact you, so we could do this how are ya? Mandark: Oh I'm good, I was in at the wizarding world of Harry Potter grand opening. I disguised as one of the workers so nobody would recognize me. Interviewer: Did anyone recognize you? Well today I am with the cast of When Dexter met Dexi and we are gonna talk about a whole bunch of stuff, is'nt that right everybody?! Dex3fan:Well then let's get started. Dex3fan:Work with oppisite gender versions of yourselves? Dexter:Well, I truth be told when I first took this job I did not know what to expect, all I knew was, that I was gonna work with Mandark and the Powerpuffs. Collectoons is a free online trading card game that allows players to collect cards from their favorite shows or movies and arrange them on backgrounds called cworlds. Collectoons has several sets to collect including a Dexter's Lab set. cartoonnetwork's "Dexter's Laboratory" home page. an answer was added to this question: What if Dee Dee’s friend Lee Lee is the main central protagonist and the heroine at the very heart (or center) of an epic coming-of-age tale? a poll was added: In Dexter's Laboratory episode called Decode Of Honor, Which one of These Two Fan Clubs would you like to join in?, Action Hank or Pony Puff Princess? a reply was made to the forum post: Christmas song! a comment was made to the poll: Who is the better scientist? Do you Agree if there Should be a Crossover with Dexter's Lab and Ed Edd n Eddy? would that be cool!